Our little boy is growing up! I cannot believe that he is already 8 months old. He is now referred to as an "older baby" (sigh). However, in my eyes, he will always be my little baby! 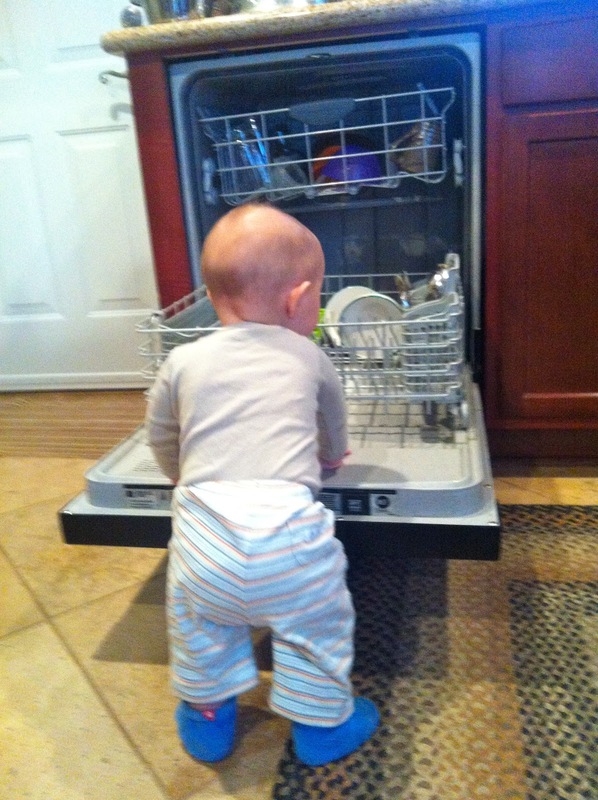 He is now starting to pull up on objects. He can grow from sitting to standing on his knees or on his feet if he finds something to hold onto (ex: the dishwasher). It is so fun to watch him these days! Our Foodie Baby continues to love to eat! He is now eating three solid meals a day (breakfast, lunch and dinner) and nursing about 5-6 times a day. One of his new favorite foods is yogurt! He loves when I mix in mashed bananas or pureed apples and cinnamon. I like to eat the leftovers too! Mealtimes continue to be a highlight of our days! I was given a wonderful opportunity to share my experience of baby food making on a fellow blogger's site www.strictlynutritious.com. The article is called "Foodie Baby in the Making". Check it out if you like! Noah also started to become more vocal this month. He babbles "mamama" all day long and our house is full of laughter and squeals these days. He sure does have the sweetest giggle too! He also likes to make the "sss" and "ffff" sounds. In public, he is still a bit reserved, cautious and shy, but at home it is a totally different story! Noah on the move! Such cute photos! I can't wait to hear what he is doing next month. Great job on the "Foodie Baby" article, Therie! I've been planning to make my own baby food as well and am now really excited about it!